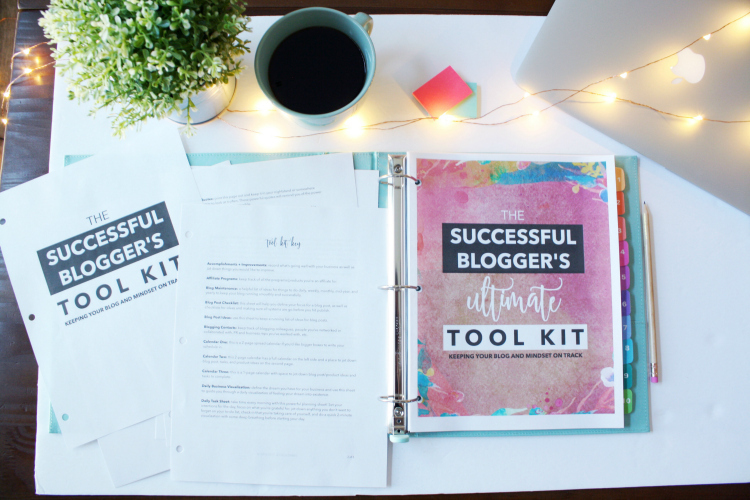 The Successful Blogger’s Ultimate Tool Kit is a blog planner kit that not only includes everything you’d need for organizing your blog, but mindset and self-care worksheets as well. 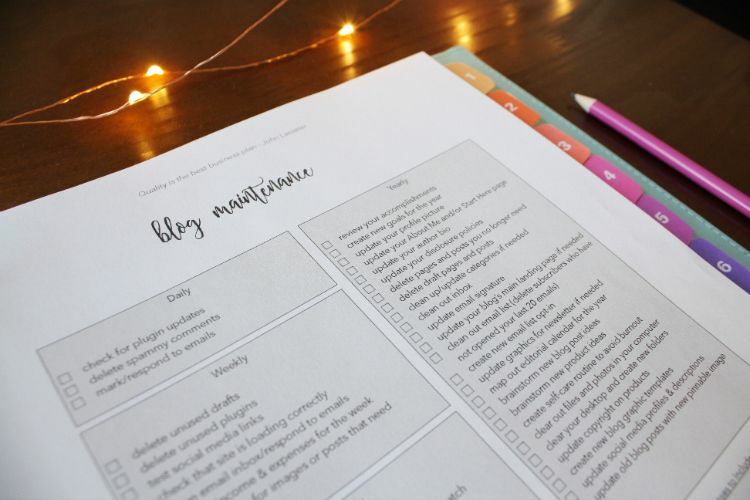 This brand new, unique blogging business planner is packed with 42 different worksheets, guided checklists, and planning sheets designed to help you keep the technical aspects of your blog organized, and to guide you in consciously MANIFESTING the business of your dreams. 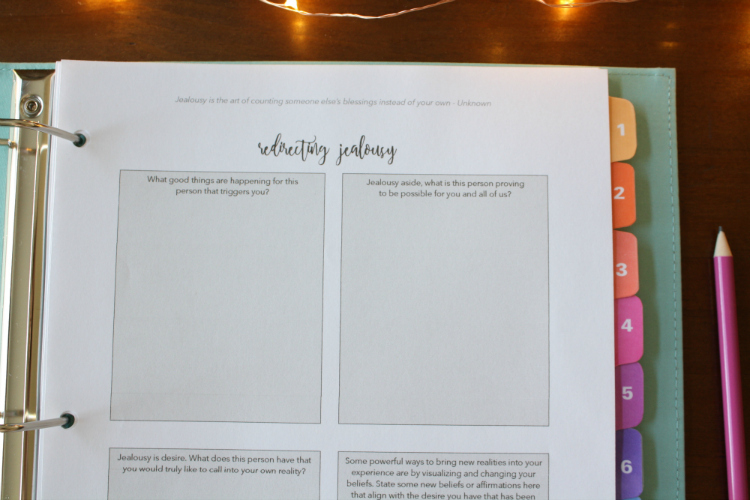 When you’re practicing regular self-care, you’ve got passion-filled inspiration on tap. When you’re dreaming big things and visualizing how you want it to be, even if it doesn’t make logical sense in the “experts” world, you’ve got the universe delivering it to you on a silver platter. When you’re writing about what lights YOU up and creating products that YOU think are awesome, rather than trying to figure out what you should be creating for others, you’ve got an engaged audience who loves your work and energy. 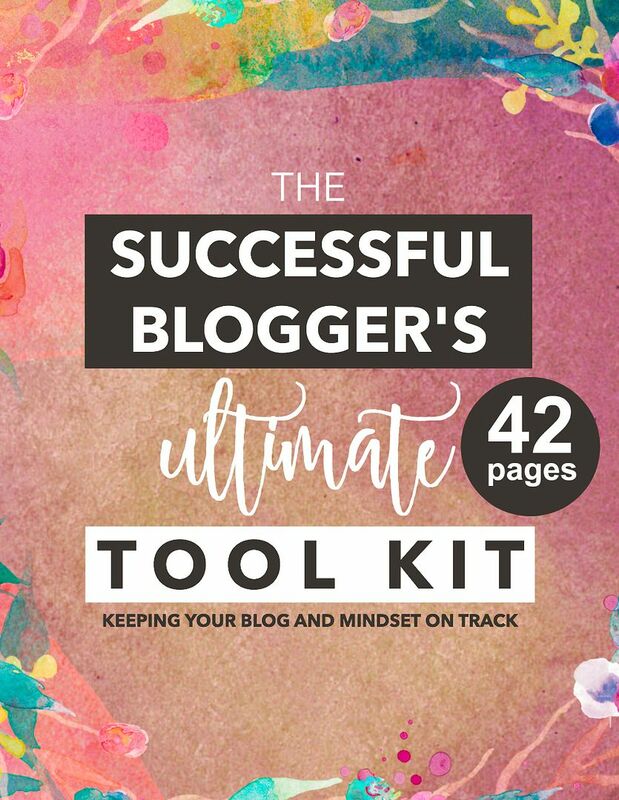 From supporting you in running a successful blog to inspiring you to keep dreaming big, this tool kit is the ultimate resource for any blogger or online entrepreneur. Will I have access to all of the updates and new sheets that are added after I’ve purchased the tool kit? Yes! 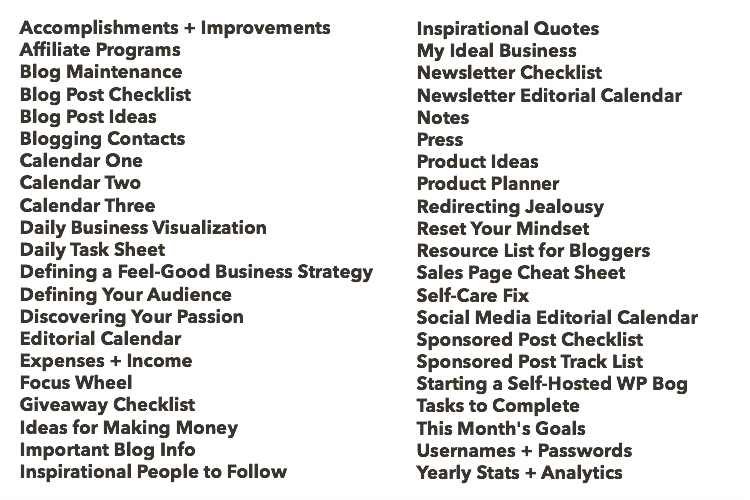 Anytime I add a new sheet or make an update, you will be notified by email. You can log into your account at anytime and download the new content free of charge. How do you suggest using this tool kit? I bought a binder and printed out the sheets that I use most often. 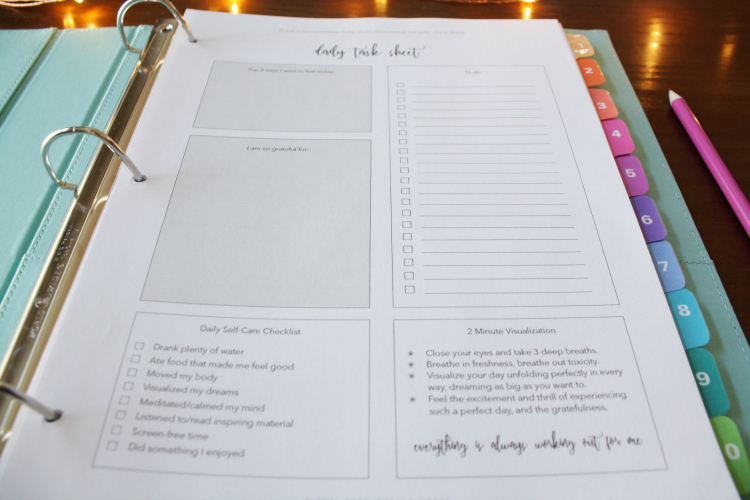 For sheets like the Daily Task Sheet, I print several out at a time double-sided. When I’m writing, I’ll take out whatever sheet I need and keep it next to me, filling it out and checking it off as I go along. Some of the sheets, like the Daily Business Visualization and Focus Wheel I keep by my bed and look over them at night. How should I print this out? 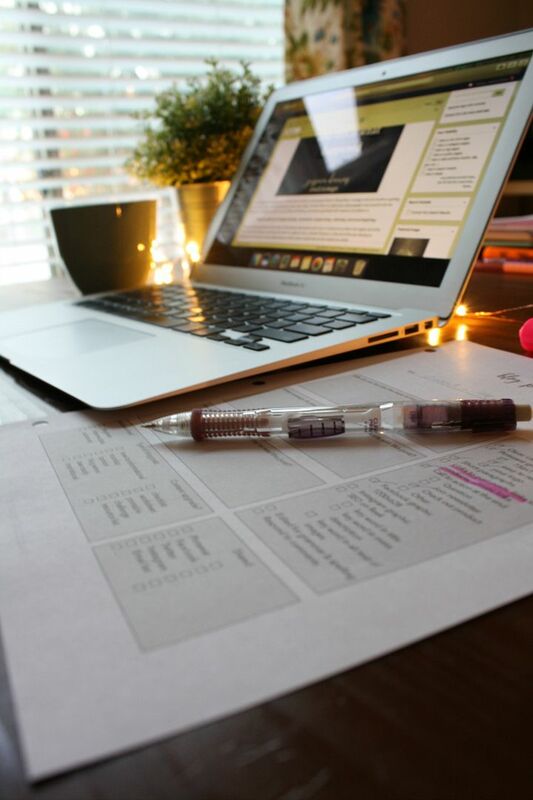 Go through the key and print out what’s most pertinent to you and your blog. I prefer Calendar 2, for example, and rarely use the other two calendars. I also like to save paper by printing multiple pages double-sided. Can the sheets be edited? 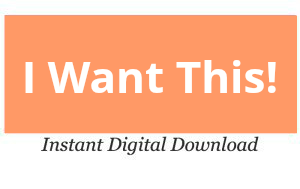 No, but they can be filled in on Adobe Acrobat. I love this but I don’t have a printer, what do you suggest? Check out Best Value Copy. They have really good prices and you can’t beat having it delivered to you. I didn’t create a smaller option because when I tested out the smaller option myself, the worksheet boxes were really too small to work with. 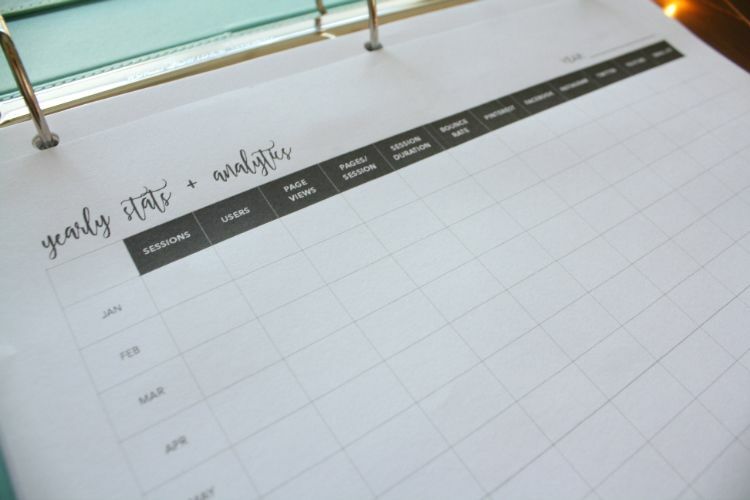 This isn’t a typical planner and really is best utilized in standard page size. You can always print it out in booklet form though and then cut it in half to fit a smaller binder. What format do the files come in? The 42 planning sheets will come in a zip file and will need to be downloaded to a computer. Everything is in PDF format. What kind of paper do you recommend so avoid bleed-through? When printing double-sided, regular printer paper can show some bleed-through. If this bothers you, I would recommend getting paper that is around 28-32lbs (105-120gsm). Average printer paper is 20lbs (75gsm). Blogging has changed my life. The sky is truly the limit in what you can achieve with a blog and online business. If there’s one message I could give to every blogger out there or anyone thinking of starting a blog, it’s that your success truly lies within your thoughts and beliefs. 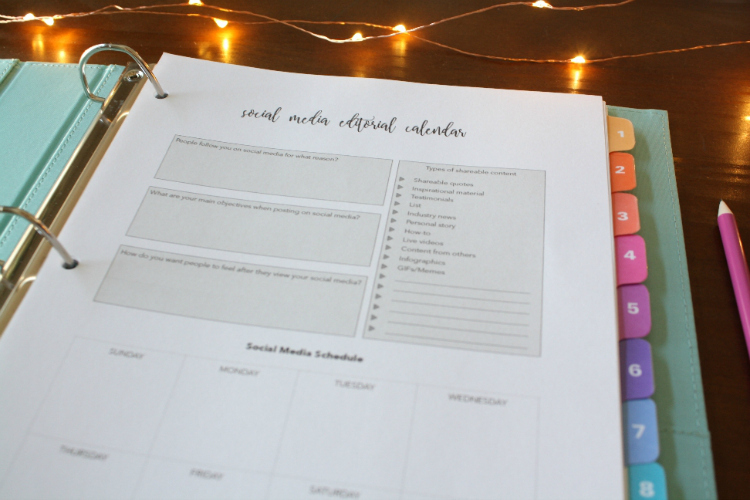 Envision your blog in it’s grandest form. Make the rules that feel good to you (one of mine is pinning only once a day and then relaxing with wine while the traffic floods in). Get it deep down in your bones that you deserve success just as much as anyone else. Then believe it and watch the magic unfold.